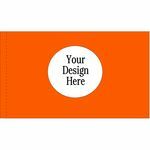 Proudly display your brand with a custom flag for all to see, whether its a corporate headquarters flag, at your brick and mortar locations or for a special event. We produce digitally printed custom flags on 200 denier nylon. This material is UV-protected and is dyed with brilliant, fade resistant inks to maximize your flag's lifespan. 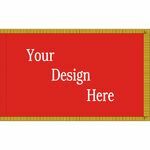 Flags are sewn with double-needle lock stitching on each side and four rows of stitching on the fly end, finished with canvas header and brass grommets. Other options are a lined (indoor use only) or unlined side pole sleeve and a side sleeve and colored fringe, all flags may be customized to any specification. Production time is usually two weeks from approved artwork. A $45.00 per hour art fee will be charged to produce the art on first time jobs. 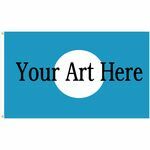 Art fee is waived if artwork is provided in .ai or . eps format. Additionally, there is no fee on repeat orders. For artwork .ai or .eps format at 300 dpi. or better is best.